Salty dessert today, or is it not a dessert if it's not sweet? Souvenir from India - thanks to Maggie's recent trip with Salaam Garage. Whenever one of us travels (both near and far) we are in the habit of bringing each other back chips or toothpaste . We think it says a lot about a place, and it's cheap. 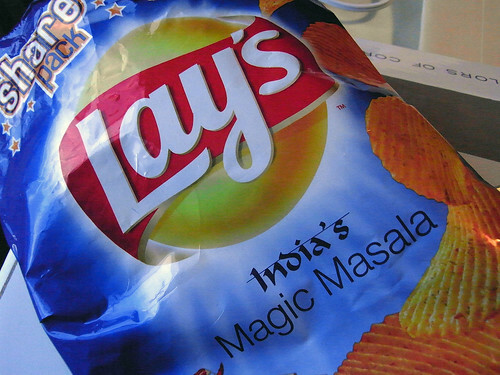 These Magic Masala chips were tangy, spicy and tasty, though the ruffles hindered the transporting effect that food can have. I'm already looking forward to the Vietnamese chips on her next trip. they were seriously a welcomed surprise towards the latter part of the trip. beat out all the other varieties.